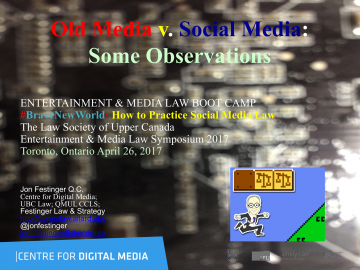 In Toronto on April 26, 2017 I participated in The Law Society of Upper Canada’s 2017 Entertainment & Media Law Symposium. The panel I was part of was entitled “#BraveNewWorld: How to Practice Social Media Law.” Being far and away the oldest of the panellists, I proved my age through my topic “Old Media v. Social Media: Some Observations”. Slides are above.